With the growing number of medals at the Glasgow Common Wealth Games and more to come in the upcoming Asian Games, we as a nation have definitely taken a big leap. However more than participating we need to create winners. This is big step in our progress especially when it comes to the mind set that India is an only -Cricket nation. What about those who love other aspects of sport and do not want to play? This is what we need to cater to. Careers like Sports Analysis , Statisticians, Sports Advertising ,Marketing, Sports Writing need to be treated as a level playing field. B-Schools have a big role to play here when promoting such careers. Courses must be provided(even if Elective) to invite the growing talent in such domains. Right now there’s an elective in Sports Marketing at only IIM Ahmedabad. Such courses need to promoted more especially since the number of B-Schools is mushrooming like never before. Sport psychology is such that has immense application and benefits in the Business field. The thought process, the killer instinct , an MBA degree can be made so much more worth it. Why only Marketing, Finance, Human Resources, Supply Chain? Deadlines, performance pressures can be learnt from Sports. More Analysis work, Predictions can be looked into as lucrative choices which would enable youngsters to remain in the Sports domain in spite of not actually getting on the field. Instead of only procuring marks at school, sports definitely needs more priority. Only then will we be richer as a nation. Getting a 100/100 in Mathematics is equivalent to winning a 100 m track event in less than 10-12 seconds. Leading B-schools abroad are offering sport management degree programs as a growing need continues to exist for qualified sport professionals in the area of sports management, sports marketing, venue and facilities management together with sport governance ,planning and development related activities. The proliferation of leisure, sport and recreation degree with definitely add to the competitiveness of the sport job marketplace. In India today, not only is the scenario not good enough but there is dearth of awareness of such careers and B-Schools by promoting them can make the public aware in the first place. What do sporting captains do? Why do only some teams perpetually win? As goes with the tremendous pressure to perform at B-Schools to stay in the race similarly the discipline required to win a major sports event is comparable. A student preparing diligently for the CAT exam and not getting through his dream School or say preparing hard for submissions, projects, resume building, toiling during those 2 critical years is similar to an Usain Bolt training hard for an Olympic event for a performance of a few seconds and unfortunately losing out. It’s the power of habit and continuous improvement or Kaizen as we call it. 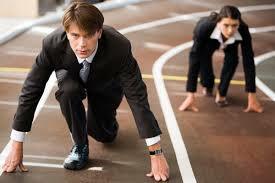 Be it stalwarts in any field of sports ,they have been successful businessmen due to their sports aptitude. Anil Kumble ‘s Tenvic (To Ensure Victory) a Sports Consulting firm or Harsha Bhogle’s Procam International(Sports Consulting Firm).Their approach and association with the cricket field has broadened their perspective(It is a different thing that Harsha Bhogle graduated from IIM-A previously)Shortly after winning a Gold Medal in diving at the 2008 Beijing Olympics, Matthew Michham was removed from the team due to questions about his sexuality. However he entered the corporate world as the face of an expanding Australian swimwear company. It is mandatory for such talent to flourish in the corporate world and deal with the nuances. Sadly Sports needs much more attention than its present scenario in our country and B-Schools need to start introducing courses to promote an exodus of talent. They could also have part time /Certified courses in these fields instead of introducing it right away in the 2-year PGDM program. I'm an ardent follower of sport and a writer at heart.Supply Chain professional. I'm a freelance writer for a sports firm and few lifestyle magazines.I strongly believe that life is all about the choices we make and being a b-school aspirant myself, an MBA is just the inception of the choices we shall make in our careers.